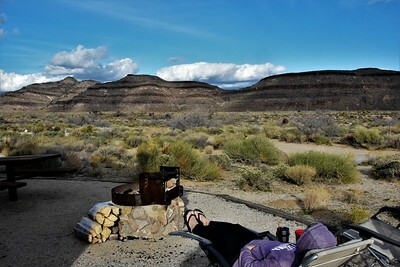 In the midst of the natural beauty surrounding us, I was too happy and too excited to just sit down and relax after our arrival at the Hole-In-The-Wall Campground at the Mojave National Preserve this afternoon. 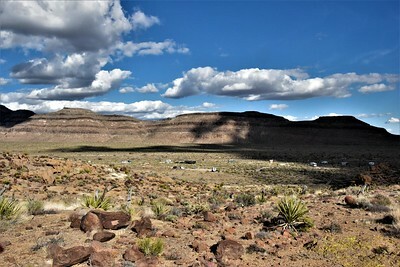 The sun went in and out from behind the puffy clouds and I took this photo from the campground looking toward the Visitor Center. 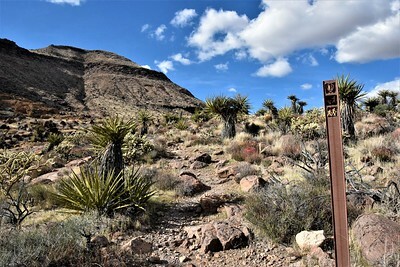 There is a short Nature Trail from the campground to the Visitor Center where there are several signs identifying the desert plants. The ranger at the Visitor Center seemed to have a rehearsed spiel and my many questions seemed to stump him a bit. I said "I saw a few jackrabbits and are the little rabbits Desert Cottontails?" He answered "I just call them all bunnies". I determined I would probably do just as well picking up some maps and doing my own research. 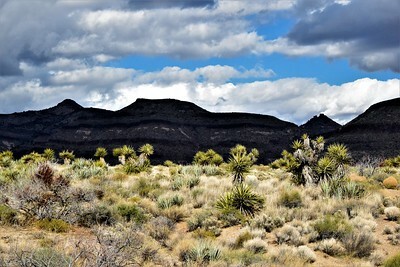 Looking east from the Visitor Center, the desert floor and the yuccas were illuminated with the mountains behind in the shadows. 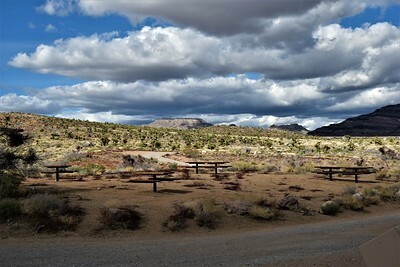 Behind the Visitor Center is an amphitheater and beyond that a road leads to a picnic area. 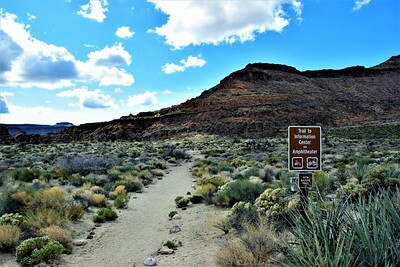 The picnic area is also the trailhead for the Barber Peak Trail, a six-mile trail encircling the little mountain beside the campground. 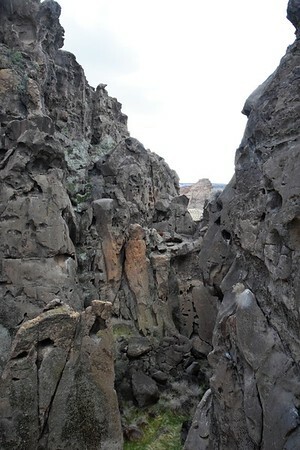 And the popular one-mile Rings Loop Trail ends at the picnic area after finishing through a slot canyon. We'll certainly be doing both of those trails. Other trails will require a good bit of driving. There was also a path leading to a viewpoint. 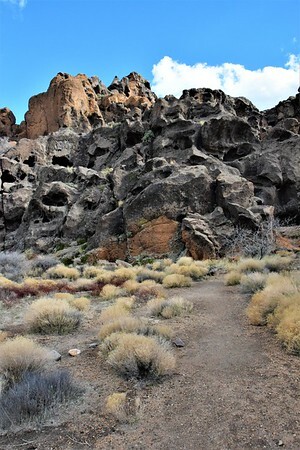 The viewpoint is hidden in amongst the rocks and the view is of the "hole in the wall" to the other side of the mountains. 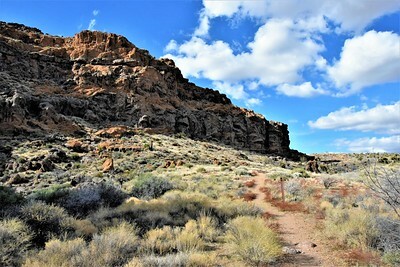 My map showed that the Barber Peak Trail was also accessible from the back of the campground, so I decided to walk to that intersection and maybe get some high views of the campground. Starting out on the Barber Peak Trail. 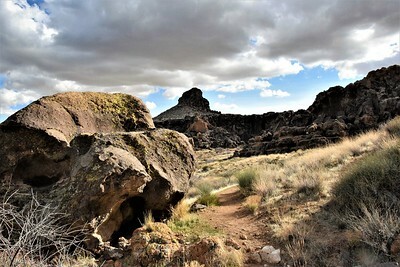 A view from the trail looking back toward the Visitor Center. Continuing up the rocky trail. 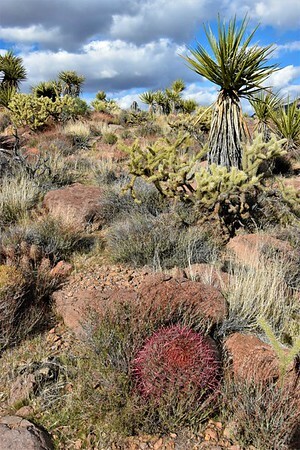 The Barrel Cactus are a bright red right now creating a lovely contrast with the other plants. 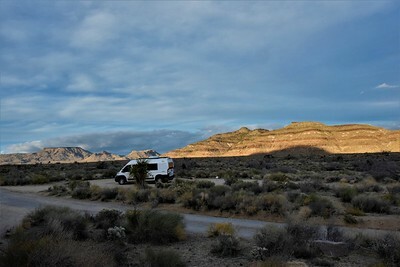 Eventually, I got a view of the campground in the valley below. 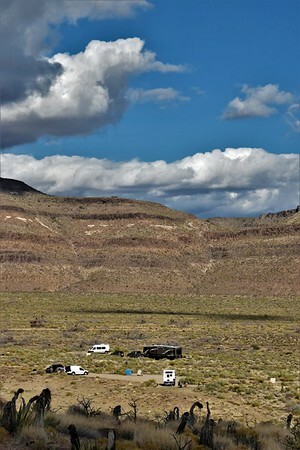 Though it may not look like if from this view, the campsites are quite well-spaced, especially in the upper section. 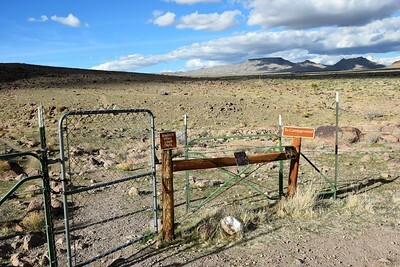 I came to the intersection where you go through the gate to continue the hike or take a right to go back to the campground. 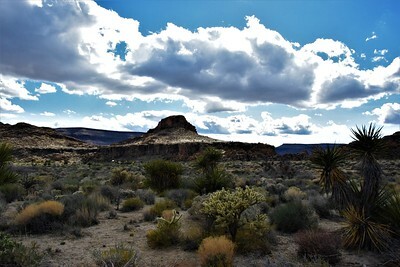 I walked back to the campground taking in the views. 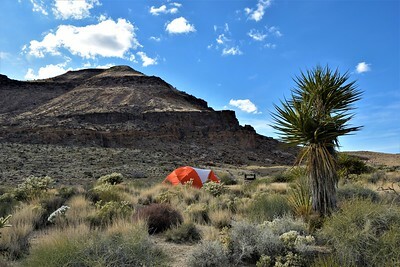 There is a lone tent-only site on this end of the campground. Sites 30 - 32 are all wonderful sites (although Site 30 is closed off for some reason). 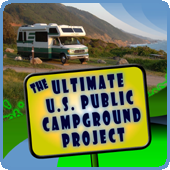 There are 35 sites in this campground and all have nice pads with picnic tables and firepits. There are pit toilets scattered through the campground, and there are restrooms at the Visitor Center. There are numerous water spigots and it would be easy to find a site where you could stretch a hose to one of them to fill your fresh water tank (when the water is available). There is a working water spigot in the picnic area, so we could easily fill up our 45-gallon water bladder there if necessary. 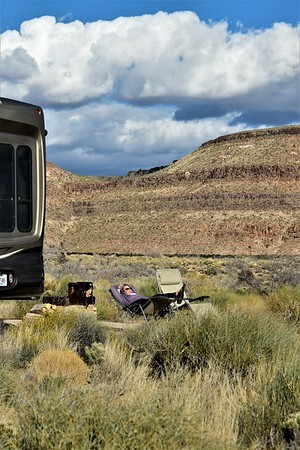 Before I left the rig, I got out our LaFuma loungers and pointed them toward the mountains behind us. Linda was reclined in the sun when I returned. At 4,400 feet it's still a little chilly when the sun goes behind the clouds. Another view of our rig. I joined Linda and we enjoyed the view and the quiet. Generators are allowed here but only between the hours of 7:00 a.m. and 7:00 p.m. Only a couple in the lower section of the campground were running. While we relaxed, the smaller cottontails hopped around us, and one large Black-tailed Jackrabbit came within five feet, but I wasn't ready with the camera. 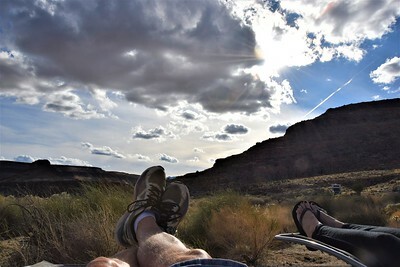 After the sun disappeared below the mountain, we turned our chairs around for a different view. 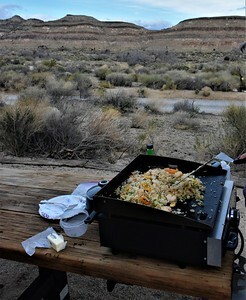 I got out the Blackstone Griddle, and Linda cooked a shrimp stir fry for dinner. I turned on the inverter to record some shows and then started a fire. I took one more photo before sitting down. 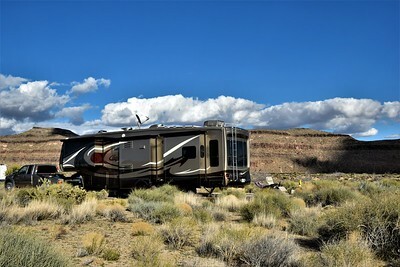 This Class B is in a large pull-through site across the road from us. My foot was in pain from brushing up against a cactus at the Boondocking Rally a few days ago. I felt like there was a spine in my foot, but a couldn't feel it or see it. Linda determined there was in fact a spine and she did surgery before it got too dark to see. Whew, glad that's out - I wasn't sure I was going to be able to do all the hiking I have planned. We enjoyed the warmth of the fire and talked as we burned one bundle of wood. As it got cooler, we opted to go inside and we went to bed around 9:30. 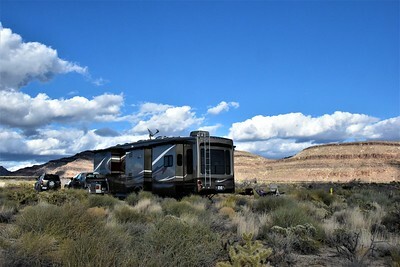 This is certainly our type of campground. 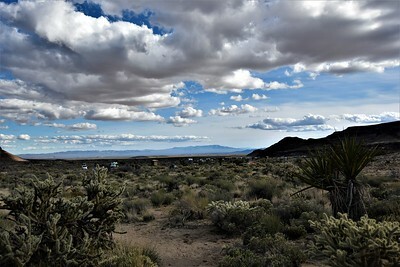 It has the "it" factor, and we look forward to exploring more of the Mojave National Preserve in the coming days. Stay tuned for lots of photos. Beautiful looking area. Glad to see you're back in your element...enjoy! Haven't been here since I was a young adult but it's as beautiful as I remember. 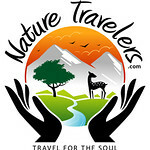 I can hear your excitement at being out in the wild with numerous trails to conquer.